One of the most important components of any teacher education program is to teach technology to teachers so that they will be able to engage with students in new and exciting ways. This isn’t merely an optional part of an educational program: Today’s classrooms are more wired for high-tech, interactive learning opportunities than ever before. Most school districts require their new hires to be comfortable with iPads, SMART Boards, projects, and all kinds of other technological items that consistently make their way into most lesson plans. Today’s best colleges and universities focus on a few key areas of technological proficiency, and they require teachers to demonstrate this proficiency in order to graduate from the program. Today’s teacher education programs are focused on giving teachers their best chance at achieving state standards compliance through innovative lessons and modern technologies. For this reason, most programs focus on a few key areas where teachers must know how to use the software and hardware given to them on the job. The first area of mastery is typically the easiest, focusing on Microsoft Office software and productivity tools. Teachers must be able to use Microsoft Word when writing lesson plans and worksheets, they must demonstrate PowerPoint proficiency, and they should be able to leverage the power of Excel spreadsheets and macros. Other areas of concern include portable devices and classroom tools. In terms of portable devices, most teachers are taught how to work with both Mac and Windows laptops in the classroom. They also learn how to use iPads for instruction and collaboration. With the rise of student-centered BYOD programs in many schools, teachers often learn how to use student smartphones as a collaborative learning tool rather than a mere distraction from the classroom. Finally, virtually all programs require teachers to master SMART Board tools and computer projectors. 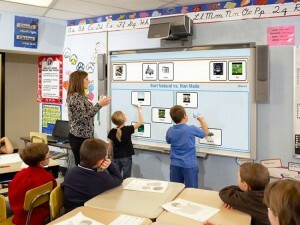 Interactive whiteboards, like the one produced by SMART, are increasingly a standard fixture in today’s classrooms. Paired with a projector, these whiteboards allow teachers to create highly interactive lessons that encourage student engagement and manipulation. Most school districts require proficiency in interactive whiteboard skills prior to hiring any new teacher. Merely learning about these high-tech opportunities is not enough in most of today’s best teacher preparation programs. Instead, teachers must be able to demonstrate that the skills learned in technology classes can be put to use in whatever subject area they intend to teach. There typically are two ways to measure proficiency and enforce demonstration of key skills. The first of these is to simply air tech classes with a laboratory component. In the lab, teachers will work collaboratively or individually on presentations, whiteboard lessons, and opportunities for integrating mobile devices. Another opportunity where teachers can show their proficiency is in an actual classroom. Student teaching allows for the creation of lesson plans and high-tech learning environments that will be observed by both the cooperating teacher and the student’s academic advisor. Most schools require at least one high-tech lesson during each student teaching placement, though some require even more. Gone are the days when teachers could barely master a VCR or DVD player. Today, the best teacher preparation programs create highly technical professionals who know how to use advanced software and hardware tools when creating an engaging lesson. The best programs teach technology to teachers in ways that are meaningful in the classroom over the long-term.